With multiple, thin honey layers and a tangy sour cream frosting, this cake is so tender it just melts in your mouth. It’s a classic Russian recipe that has been loved for generations. Medovik is, hands down, my favorite cake and is totally worth every ounce of effort that it takes to make it. My mom has been making this cake since before I was born. I loved watching her in the kitchen; I was always in awe of how she expertly made beautiful creations right before my very eyes. She made it looks so easy and effortless. As I watched her, it all seemed so magical and I couldn’t wait until I made this cake myself. I was probably about eleven or twelve when I felt confident enough to approach her and plead with her to let me have a try. Mom told me it was a really hard cake to make, really finicky and I wouldn’t be able to do it. Well, she didn’t forbid me from making it. The next time Mom wasn’t home, I rolled up my sleeves and made this cake, from start to finish. When Mom came home, the Medovik was finished and standing proudly as if personifying my victory. (By the way, this is exactly the same thing that happened with Borsch and Napoleon Cake.) Ha ha! I was always a very determined girl:). Love you, Mom! 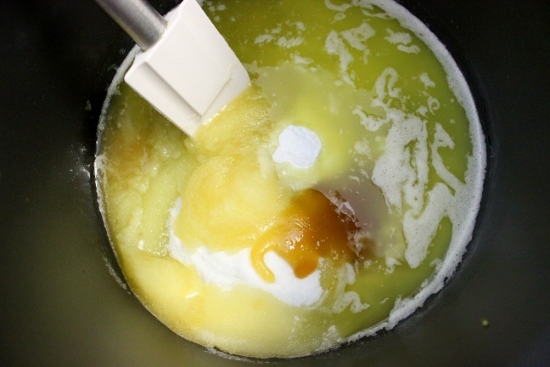 Place the butter and sugar in a large nonstick pot. If you don’t have a nonstick pot, or your pot burns easily, you may wish to use a double boiler. (Just place a metal or glass bowl on top of a pot with about an inch or water in it and keep it simmering, but make sure the bottom on the bowl never touches the simmering water. Add more water if it evaporates. Cook it just until the butter melts but is still barely warm, NOT HOT. Take it off the heat. Add the eggs, baking soda and honey and mix to combine. This is important, if you add the eggs to hot butter, it will scramble. Cook the mixture on medium low heat for about 7 minutes, longer if you’re using a double boiler. 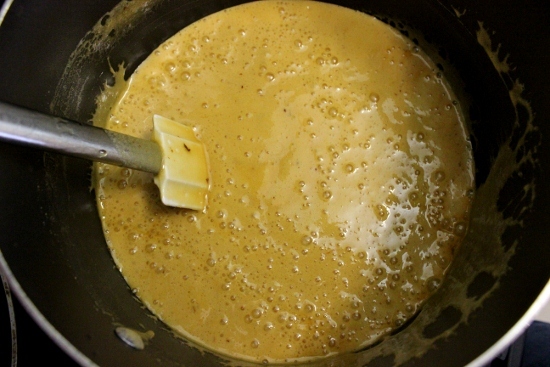 The batter will puff up and turn a deep caramel color. Add the flour and mix quickly with a wooden spoon. I always add less flour than I need and add more when I’m rolling out the cake layers. If you add too much flour, it will be really hard to roll out. On a lightly floured surface, roll out the cake layers. Take approximately 1/4 cup of batter and knead it on your work surface. If it’s sticking to your hands and the counter, add more flour. Roll it out thinly into somewhat of a circle. 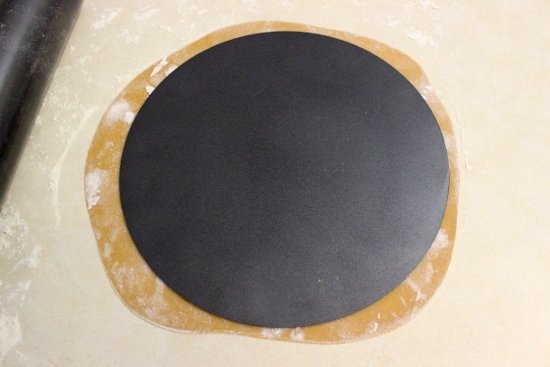 Use the bottom of a cake pan or the bottom of a tart pan to cut around it with a paring knife to make a perfect circle. You can save all the scraps just the way you cut them and place them on a baking sheet and then bake. Later, you can crush them into crumbs and sprinkle the sides and top of the cake. I usually just take the scraps and knead them into the batter as I roll out each new cake layer. It works great. I use 2 (9 inch) round tart pans to bake the cake layers. If you don’t have a tart pan, use a rimmed baking sheet, sprinkled with flour or lined with parchment paper. 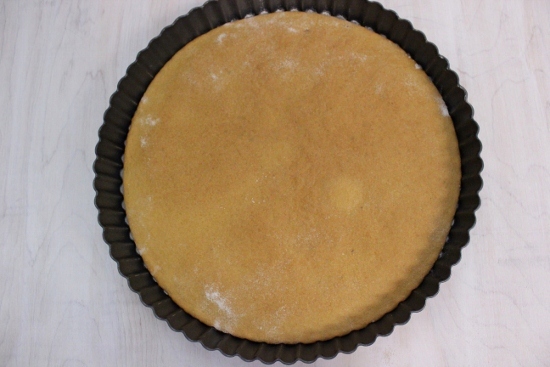 Sprinkle the bottom of the tart pan with flour and bake the cake layers for about 4 minutes each. Take them off the tart pan right away. As the cake layers cool, they will become pretty hard. Work quickly; you can roll out the cake layers and set them aside, waiting to be baked. You want to roll them all out while the batter is still warm. As the batter cools, it becomes harder and harder to roll out. You will end up with about 10-12 layers. 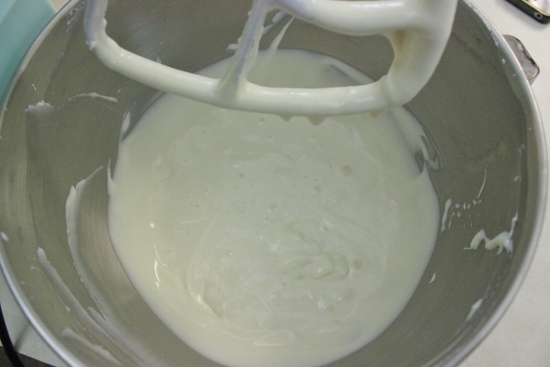 Cream the softened cream cheese and condensed milk in a standing mixer with a paddle attachment or using a hand mixer until it’s well combined. Add the sour cream and vanilla. In another chilled bowl, whip the heavy cream with the powdered sugar. Gently fold it into the rest of the frosting. Dust off any excess flour from the cake layers. Line your serving plate edges with aluminum foil. 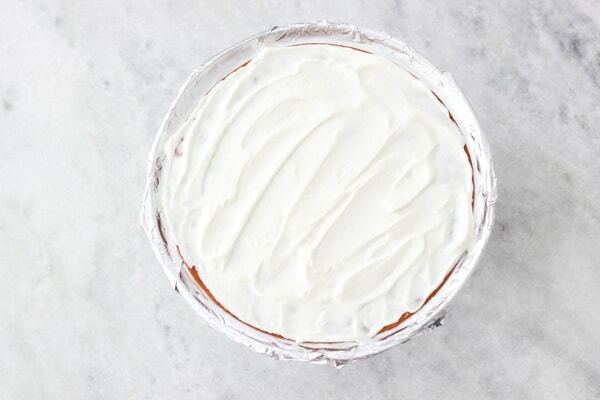 Place a dollop of frosting into the center of the plate, just to keep the cake from sliding around. Top each cake layer with about 1/4 cup of frosting and spread it around evenly. Repeat with all the cake layers. As you place the layers on top of each other, some of the frosting will ooze out of the sides. Spread it out evenly over the sides. Gently remove the aluminum foil. 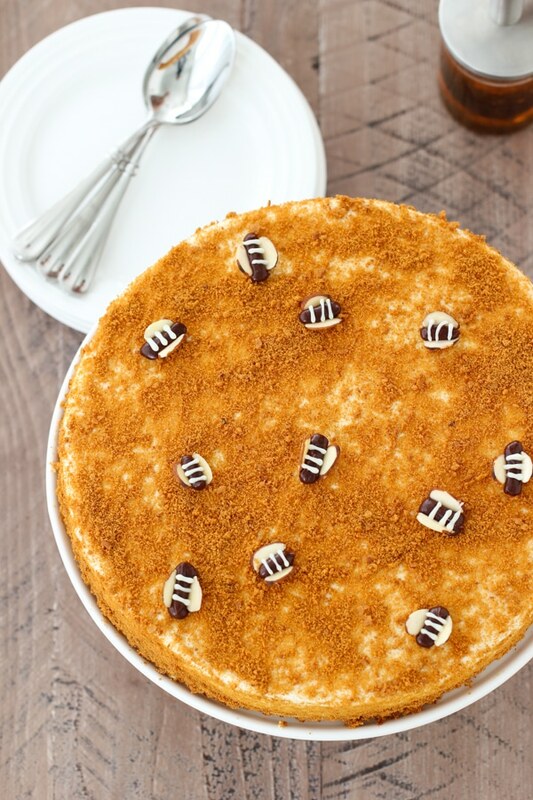 Decorate with crushed cake layer crumbs. I also make little bees to decorate the cake. Here’s the tutorial on how to make the bees. 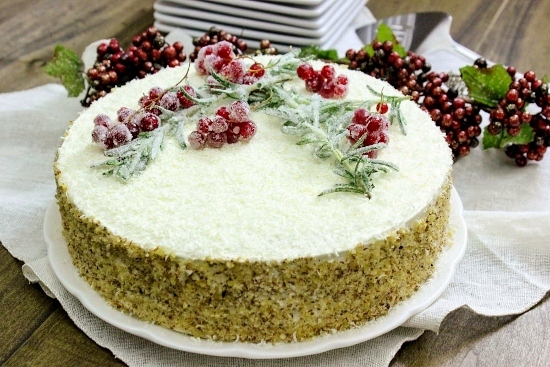 During the winter, here’s a really beautiful way to decorate the cake. Heat 1 cup water and 1 cup sugar in a small saucepan just until the sugar dissolves. Pour it into a shallow dish. Place about 1/3 – 1/2 cup of sugar in another shallow dish. 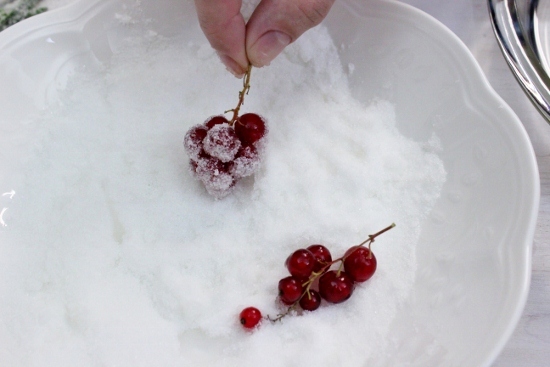 Dip the rosemary and the red currants in the sugar syrup and dip it in the sugar. Place on a parchment paper to dry and then place it on the cake. Now you have a beautiful winter masterpiece. 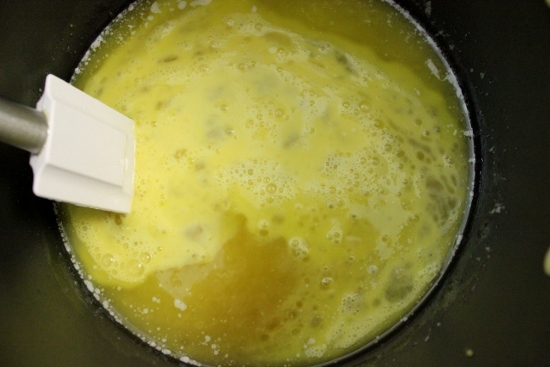 Place the butter and sugar in a large nonstick pot. If you don’t have a nonstick pot, or your pot burns easily, you may wish to use a double boiler. (Just place a metal or glass bowl on top of a pot with about an inch or water in it and keep it simmering, but make sure the bottom on the bowl never touches the simmering water. 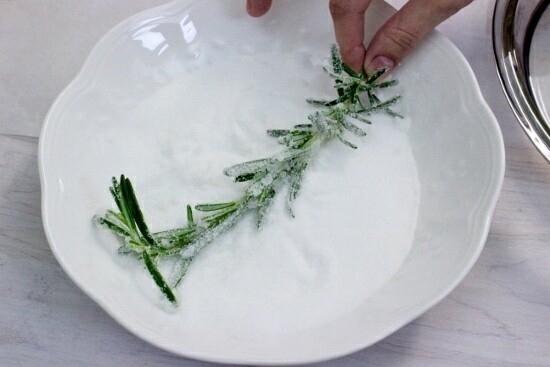 Add more water if it evaporates. Cook it just until the butter melts but is still barely warm, NOT HOT. Take it off the heat. Add the eggs, baking soda and honey and mix to combine. Cook the mixture on medium low heat for about 7 minutes, longer if you’re using a double boiler. 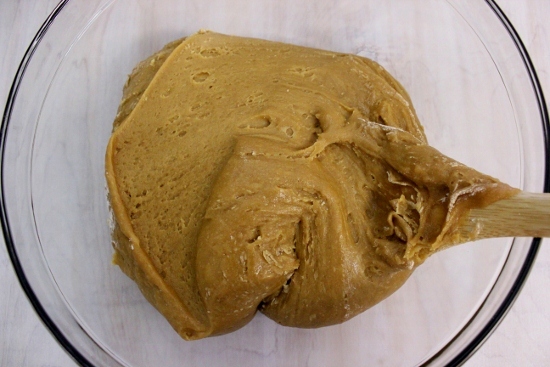 The batter will almost double in size and will turn a deep caramel color. Take it off the heat. Add the flour and mix quickly with a wooden spoon. I always add less flour than I need and add more when I’m rolling out the cake layers. If you add too much flour, it will be really hard to roll out. Take approximately 1/4 cup of batter and knead it on your work surface. If it’s sticking to your hands and the counter, add more flour. Roll it out thinly into somewhat of a circle. 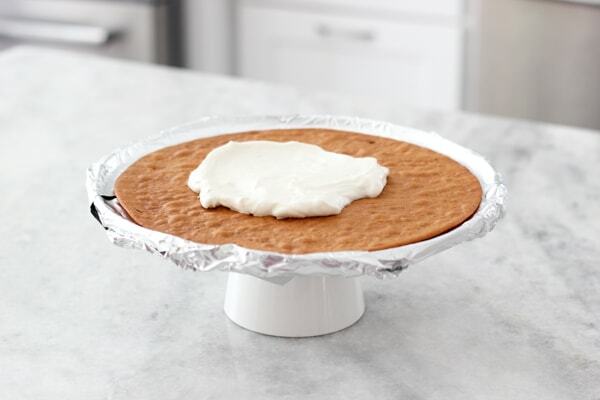 Use the bottom of a cake pan or the bottom of a tart pan to cut a perfect circle. You can save all the scraps just the way you cut them and place them on a baking sheet and then bake. Later, you can crush them into crumbs and sprinkle the sides and top of the cake. I usually just take the scraps and knead them into the batter as I roll out each new cake layer. I use 2 (9 inch) round tart pans to bake the cake layers. If you don’t have a tart pan, use a rimmed baking sheet., sprinkled with flour or lined with parchment paper. Take them off the tart pan right away. As the cake layers cool, they will become pretty hard. Working quickly, repeat with the rest of the cake batter. You can roll out the cake layers and set them aside, waiting to be baked. You want to roll them all out while the batter is still warm. As the batter cools, it becomes harder and harder to roll out. You should have approximately 10-12 cake layers. 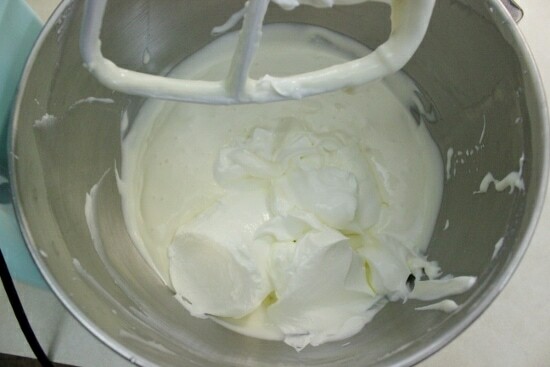 Cream the softened cream cheese and condensed milk in a standing mixer with a paddle attachment or using a hand mixer until it’s well combined. Add the sour cream and vanilla and mix to combine. In another chilled bowl, whip the heavy cream with the powdered sugar. Gently fold it into the rest of the frosting. Line your serving plate edges with aluminum foil. 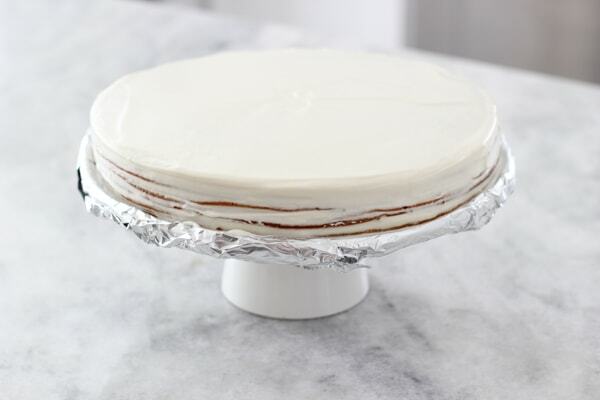 Place a dollop of frosting into the center of the plate, just to keep the cake from sliding around. Grate some white chocolate on top of the cake and chopped nuts or crushed cake layer scraps over the sides of the cake. Heat 1 cup water and 1 cup sugar in a small saucepan just until the sugar dissolves. Pour it into a shallow dish. Place about 1/3 – 1/2 cup of sugar in another shallow dish. Dip the rosemary and the red currants in the sugar syrup and dip it in the sugar. For the decoration, I’ve never purchased rosemary and currants before, where can they be purchased? I bought it in a regular grocery store. 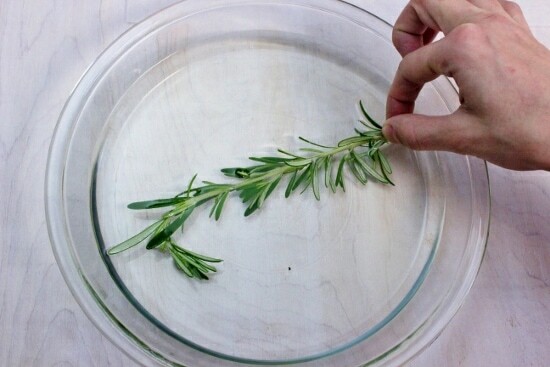 Rosemary is sold in every store, usually with other fresh herbs. Red currants are very seasonal, so you may not be able to find them. You can easily substitute cranberries. I was wondering would it be ok to substitute whipped cream with heavy cream? Wow this cake is so beautiful and festive!! You are so creative Olga! beautiful! How many days in advance can you make the karshe? You can bake the layers approximately a week and a half in advance. Just make sure to store them at room temperature, very well sealed. Olga you don’t know how excited i am right now. I love you so much! I tried making medovik two times….and guess what? Failed both times! It is my husbands favorite cake and i cant even make it…..Now I can! With your wonderful guidance! Thank you so much! Now i know what cake I will make for Christmas! Hello Olga ya hotela sprosit ho much is 16 oz sour cream, and 1 srick butter? 16 oz of sour cream is approximately 2 cups. 1 stick of butter of is 1/2 cup, or 8 Tablespoons. Thank you Olga. I am going to cook the Honey cake this Sunday. Let me know how it turns out, Nodira:). It’s in the works, Elena:). Thank you for the recipe. I cooked the honey cake it was delicious, everyone liked it. My friends thought I bought the cake from the shop. Because the Cake layers were profesionaly done. 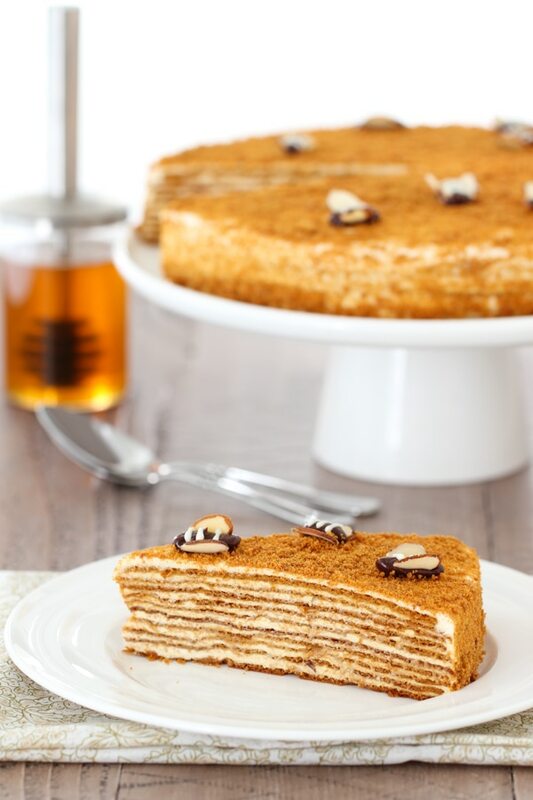 I have similar recipe of a honey cake it is yumyyy too. Olya, thanks for the lovely recipe! Can you please tell me what temperature to set the oven for baking the cake layers? Thank you, Julia. 350 degrees. Thank you so much for posting this. Your pictures and directions are so easy to follow. I make this cake but can never explain it to anyone. The only thing that I do different is to cut the layer into a circle as soon as it comes out of the oven. The edges are softer, more even and rarely burned. I also use whipped cream and cooked sweetened condensed milk for the frosting, but will try out your recipe next time. I tried to make your cake, it is very nice. It is similar to my mum’s cake recipe but she makes a cream differently with butter. When I purchased sour cream I wasn’t sure about the peasant age of fat so I bought 20% fat but I think the cream wasn’t thick enough even though very tasty. What sour cream do you usually use? The frosting is not supposed to be thick. If you’re thinking of butter cream, it is definitely much thicker than a frosting made from sour cream, however, I personally do not like butter cream. The sour cream I use is the regualr full fat version that is sold in grocery stores, not the low fat, part skim, any of those sour creams. I’m not sure what %fat content is in the sour cream. I’ve never noticed it written anywhere on the package. This is my favorite cake and you decorated it so beautifully! You’re amazing! Thanks, Snow! This is one of my favorite cakes as well. Oh how I love this cake! I have been looking for “the” honey cake recipe that would be like the classic from my childhood. You have done it Olga:)) I made it twice already, and I absolutely love it! I’m so glad to hear that you liked the cake, Marina! That’s wonderful. 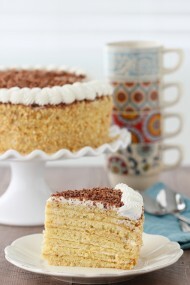 Olga, I am planning in making this cake:-) my question is, can I substitute the heavy cream for whipping heavy cream? What’s the difference? Thanks! Heavy cream and heavy whipping cream are basically the same thing. Yes, they will both work. However, heavy cream has a slightly higher fat content, so it will keep it’s shape better and longer. Heavy whipping cream will whip up too, but it will deflate faster. For this recipe, both will work just as well. 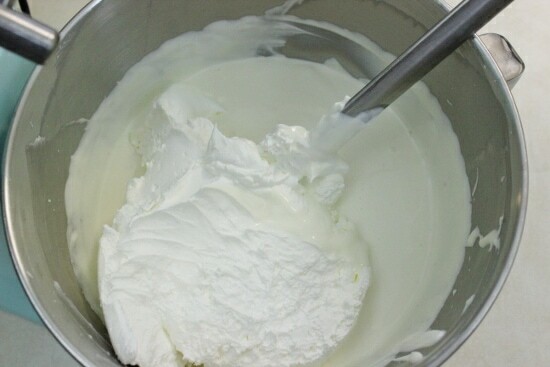 If you’re whipping up cream for desserts where the whipped cream is on it’s own, it’s best to use heavy cream. The cake turned out so delicious! Thanks, blueberry:). I like any tricks that make life a little simpler. I should say I admire your talent. You are clearly very artistic. I like the care that you use in your creations. I have a couple of questions regarding the honey cake. I used to make it long time ago. There were diferent variations on it. I remember making man’s ideal, which was a no-fat batter cooked on a double boiler. Now I am trying to make it and every time I fail. I should say that I am not a novice when it comes to baking. What I do not like in the recipes I use is that they do not seem to be porous, and, most importantly they do not turn brown even though I use honey and cook them. What I remember about these honey cakes is that they were soft and chewey. Not the ones that I bake now. PS I am going to try your recipe this Friday, but if you have any tips, I would really appreciate. Did you already try this recipe? I’m not exactly sure what you were having trouble with. If you follow the recipe, it should turn out. I try to be very detailed in the instructions. Olga, I did try this recipe on Friday and cut it yesterday. Wow! it worked perfectly. I used dolce de leche and equal parts of whipping cream and sour cream. (It took me 8 recipes to find the right one, but it was worth it). Thank you so much! Olga, I was wondering if you had the recipe of’mujskoi ideal’. I’m so happy to hear that, HB. Thanks for taking the time to write and tell me. Can you describe the cake to me? Sometimes there are different cake names. The cake I am referring to has eggs, sugar, honey and flour (no butter). It is made on a double boiler. It is not a thick dough, so you either press it on foil or spread with knife. It is very porous and chewey. You peel the foil when it is baked. The frosting is dolche de leche and butter (but frankly I like the version with sour cream and whipped cream better). You put walnuts between the layers and on the top. Does this ring a bell? I imagine all former Soviet bloc was making this. Another favorite from that era was bird’s milk (ptich’e moloko) – not the one with souffle, but the layered cake with ganache on top. No, I don’t know this cake, HB. Sorry. olga, спекла медовик по твоему рецепту! получилось замечательно, необыкноенно нежный торт! мои гости были в восторге! спасибо! That’s great, Julie! I’m thrilled to hear that. Can i use 8oz cool whip instead 1 cup heavy cream?? If that’s what you prefer, sure:). I don’t use Cool Whip, but if that’s what you happen to have, it can certainly be used. Oh my goodness Olga! SO beautiful! Just glorious, really. I cannot wait to make this next Christmas. Since the cake doesn’t rise much, I’m going to try converting it with gluten free flour for my family with allergies. 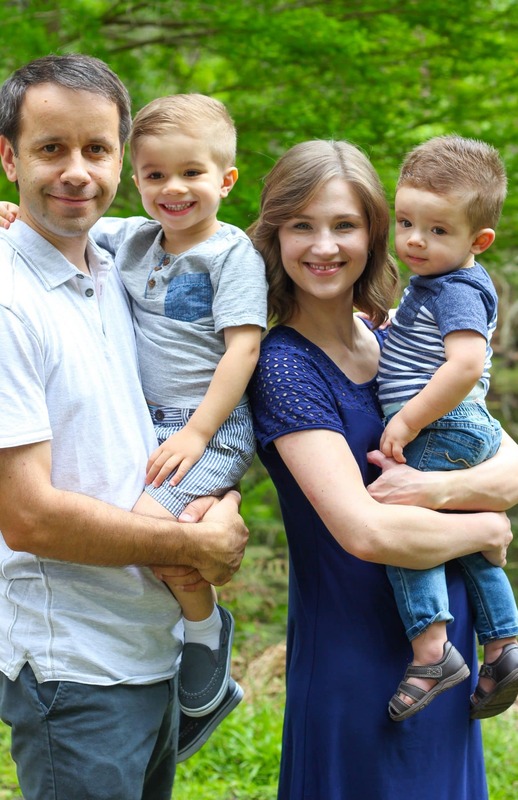 Thank you for your wonderful blog! I made this cake last night in honor of the Sochi Winter Olympics opening ceremonies. Everyone loved it and we going back for seconds before the finished their first piece. It was surprisingly delicious. It wasn’t too hard to make but it looks like it takes a lot of work 🙂 Thank you for this recipe I will definitely be using it again. What a great idea, Chevas! I’m happy to hear that you enjoyed the cake. It is definitely a Russian favorite:). I am so excited to make this cake for my family this weekend. 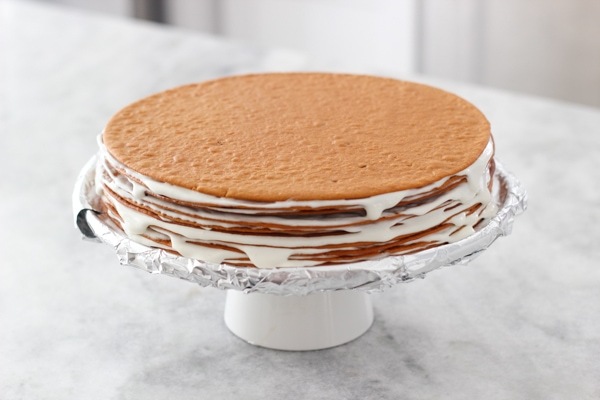 I am trying to plan ahead….can I bake the layers on one day and then make the frosting and assemble another day, or do I have to do it all in one day (not sure if the layers will get too hard if not assembled the same day). Or another options is, could I make the cake completely two days before serving? Would it get too mushy? You can bake the layers ahead of time, even up to a week ahead of time. Just store them somewhere tightly wrapped so they don’t absorb the smells of the room, etc. You can also make the whole cake a day or two in advance as well. It will not get too soggy. I made it!!!! It’s SOOOOO GOOD! Thank you so much for posting this great recipe! My Russian and American families were quite impressed. By the way, in the last two weeks I also made your recipes for pelmeni, chicken kotleti and the salmon appetizer cake. All were AWESOME! Can’t wait to try more Olga’s treats! I’m so happy to hear that you had good results with the cake, Susanna. 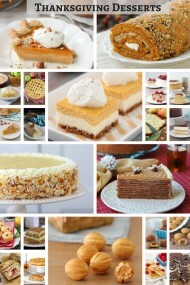 I’m so honored that you’ve been using some of my other recipes too:). I’m always thrilled to hear that. Love it! I made Medovik with 16 layers for my wedding…. Only I made a traditional cream – whipped butter with sugar + кляр. I will definitely try yours. Thank you! I just made this cake… and I’m not sure why you roll it out while it’s still warm. If you pre-measure the dough into whatever sizes you want and then chill them in the fridge it is Sooooo much easier to work with! I remember I used to see my mom doing this (I would sneak into the fridge and eat the cake batter). I think the honey in the cake is why you can do this (as opposed to spartak which would become a hard rock). Just a suggestion 🙂 Thanks for all your recipes!! For me, it’s much easier and a lot faster to roll it out while it’s hot, Dee.I have tried to roll it out when it’s cold, and for me, there is a significant difference. That’s awesome, Anna! I’m so happy to hear that you enjoyed the cake. Medovik is one of my favorites for sure. Hi there! First, I just wanted to say that I make a lot of your recipes (as do many people I know! ), but I rarely comment. I appreciate how detail oriented you are, and I love the little tips you sprinkle throughout your recipes, and how you explain things (like how Yukon potatoes hold their shape better, etc). I know you have quite a following, but I’m always surprised it’s not bigger… your recipes always come out great when I make them, whereas many other slavic-recipe based sites have hard to follow instructions, or jthe recipes ust don’t taste like mama’s cooking. So, thank you for the recipes! 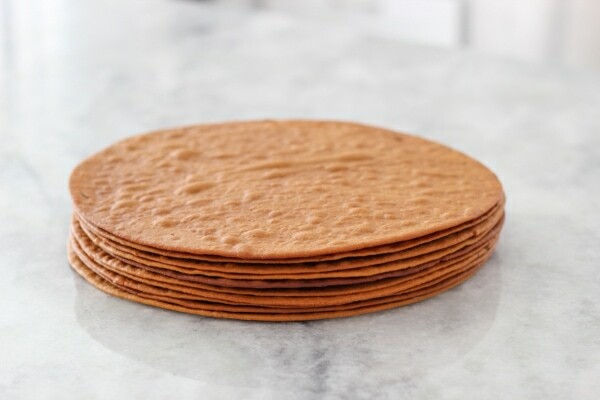 Regarding this recipe- is there a reason you cannot use parchment lined 9″ baking pans? 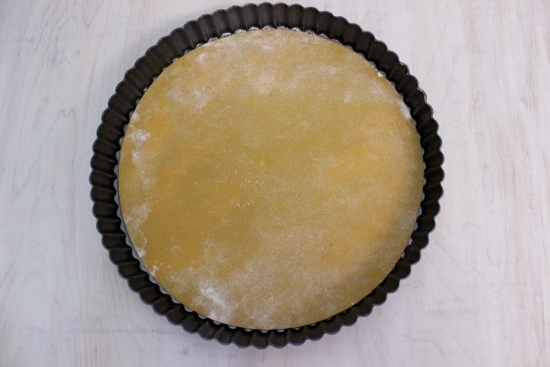 Your instructions state to use a tart pan, or to just lay the layers onto a rimmed baking pan. Just wondering the reason, since I’ve never made this cake. Thanks! Thanks for taking the time to write, I really appreciate it. 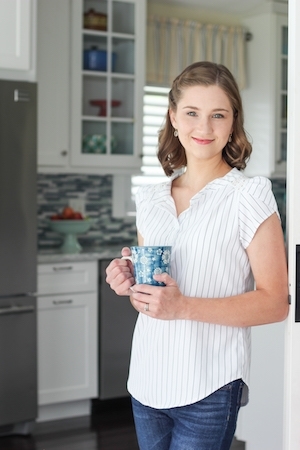 I’m thrilled that you find the tips helpful and are enjoying the recipes. I wouldn’t recommend using regular baking pans because these cake layers are very delicate and would be difficult to take out of the pan without breaking them. … I went ahead and made the cake– it was delicious! I’m looking forward to making it again (my waistline probably not so much). Thank you for answering my question; I came to the same conclusion while baking the layers. God bless you with your pregnancy. Yay! Glad to hear that you liked it. That’s great, Christina. I hope you enjoy it. 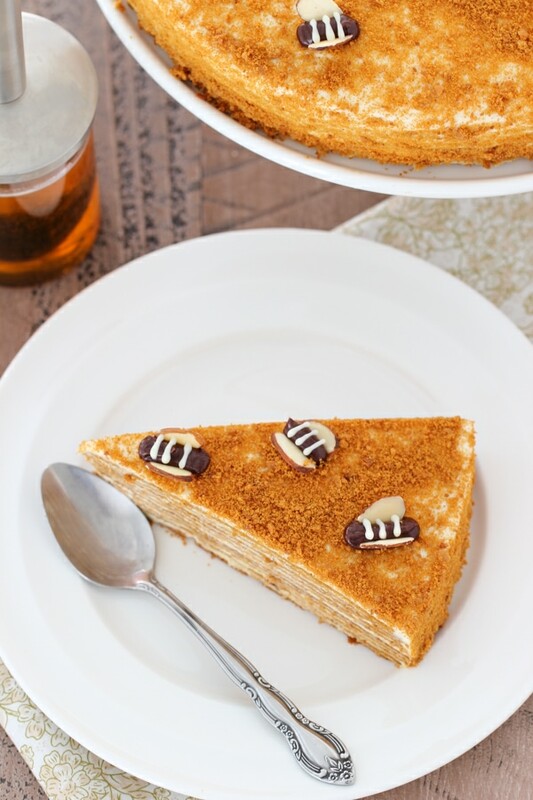 had my tertiary education in Russia and this torte was my favorite back then! thanks olga for the recipe, will hit the kitchen soon! I had a question. In the ingredients you mention to add sugar to make the dough but in the instructions you don’t. I made the dough twice. First I added the sugar during the end of the 7 mins I heat up the dough and the dough turned out ok but not great. Then I tried adding the sugar with I melted the butter and the dough came out very crummy. Adding the sugar is the first step in the recipe, Mary. “1. 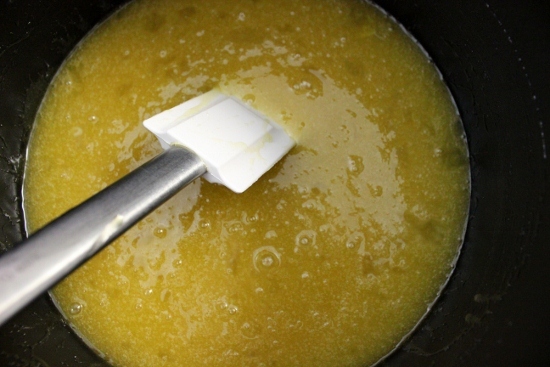 Place the butter and sugar in a large nonstick pot. 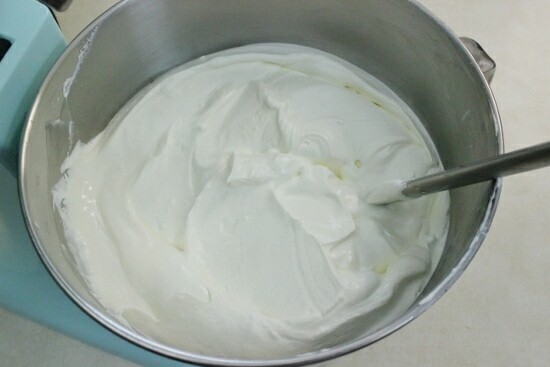 The cake dough should not be crummy, it should look like the picture – smooth and evenly mixed. GOD BLESS YOU AND HAVE A MERRY CHRISTMAS!!!! Thank you so much, Valentina! I’m so happy you enjoyed the Medovik. It’s one of my absolute favorite cakes. God bless you too and Merry Christmas. I made this cake and it was delicious but the cake layers didn’t get hard. Should I be adding more flour? Even with longer cooking time they just started to burn but not get any harder. Thanks ! The cake layers will not be hard while you are baking them and while they are still warm, Rachel. They will get harder as they cool. If they were still really soft after they were completely firm, then maybe you didn’t roll them out thinly enough or maybe they did need more flour, although I’ve never experienced them not becoming harder as they cooled. I’m glad to hear that they cake was still tasty even with all the trouble that it gave you. I’m so glad that you enjoy the cake. The thinner you roll out the cake layers, the more likely that they will bake up to be harder, Elsa. That is normal. I actually prefer to bake them as thin as possible, and the cake layers are pretty hard. They become very soft when you add the frosting, so it really doesn’t matter what the texture of the cake layers are after you bake them. They will have the same texture and flavor after the cake is frosted and has a few hours for the frosting to penetrate into the cake layers and get soft. If you don’t use a double boiler, it’s especially important to mix the batter frequently, so that it doesn’t burn and cooks evenly. I just made this cake and it looks absolutely beautiful – thank you. I followed your recipe step by step, but I only got five 9 inch cake layers. So my question to you is, when you say cups, do you mean measuring cups or regular cups? I understood it to be measuring cups but although I rolled my layers rather thin, I didn’t get as many layers as you did. Thank you once again and happy holidays to you and your loved ones! Iam making this cake now, and to caramelize its making me more then 30 minutes is that normal? When your Recipe says 7 minutes? Help? You said 1/2 a can of condensed milk.. What size can? I am making this this weekend & I want to use your recipe because all your other recipes have been amazing! Hope you reply soon! There’s only one size that I’ve ever seen sold. I believe it’s about 14 oz in one can. However, the size doesn’t really matter. It’s a matter of taste, so add as much sweetened condensed milk as you like, so that the frosting is as sweet as you like. You can add a little less than one can or more than half a can. The recipe looks beautiful! Is it possible to make this cake (and frost it as well) on a Tuesday and then serve to guests in a Friday, or is this too many days for it to sit frosted? Trying to plan ahead….very excited about making this…. I personally prefer to frost the cake 1-2 days in advance max. You can bake the cake layers and make the frosting 2-3 days in advance and frost it 1-2 days in advance so that they cake tastes fresher when you serve it. You can use any baking sheet. Was your dough still warm when you were finished mixing in the flour? It’s important to mix the dough very quickly so that it is still hot when you are adding the flour and warm when you are rolling it out, otherwise it gets really tough and hard to mix. 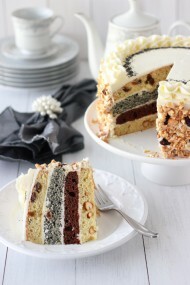 Great recipe for the cake layers! Except every time I cook it until it turns brown it becomes impossible to roll out big thin circles.. breaks apart like crazy 🙁 I started cooking it only 5 mins it’s not very brown as shown on your pictures but it rolls so easy and the taste is just as great. 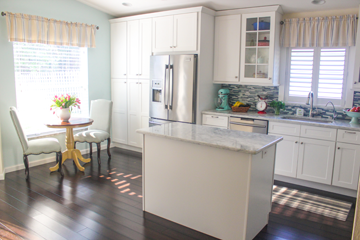 Yes, time is not the best way to tell if something is done or not, that’s why I try to include the step by step photos and other visual cues to look for. They dough should be soft and easy to roll out. I’m glad you figured out how to make it work. I made this cake last night. Turned out amazing and nothing is left. Need your advice about the frosting. I used sour cream + heavy cream + powdered sugar. Do you use it? What would be the measurements for this cake? I’m so glad you enjoyed the cake, Marina. You can certainly use this frosting for the Medovik cake. Unfortunately, I can’t help you with measurements and quantities of ingredients. I use the frosting that I posted in the recipe. You will need to experiment. Hi Olga, I’ve made this cake several times using a different recipe and I decided to try yours out, and the layers turned out perfect! 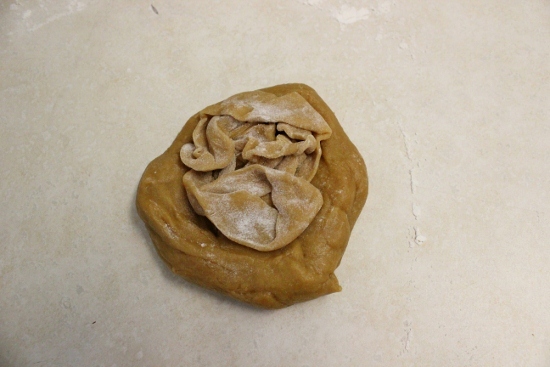 But when I was rolling out the dough it kept “cracking” like it wouldn’t stretch out properly when I was rolling it out. Do you know what would cause that? Usually this means that the dough is too cold or there is too much flour, Anna. In my experience, if you roll out all the cake layers while the dough is still warm, it’s much easier to work with and rolls out very smoothly with no cracking. I hope that helps. I’m so glad you were happy with the cake, Irina. Thank you for taking the time to write.